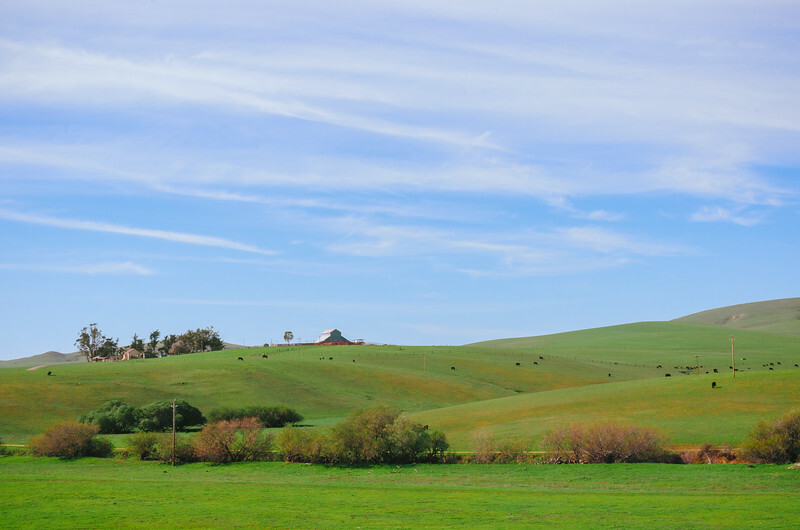 A cattle ranch near Cambria on California's Central Coast after recent rains. The green hills were just begging to be photographed. It was really just a matter of finding a good spot off the road -- and without telephone poles in the way. It took a while, but we found this spot. I knew I wanted the big view of a couple of hills intersecting, perhaps with some cows and a blue sky set against the green grass. The barn atop the hill was the bonus. This is exactly the kind of photo I strive for: little humanity versus big landscapes. The photo was taken with my Nikon D5100 and the Nikon DX 35mm 1.8 lens -- an obvious choice for such a task. Please check out my SmugMug site for other pics, prints and licensing.